Mom's Owl Collection, Volume 2! 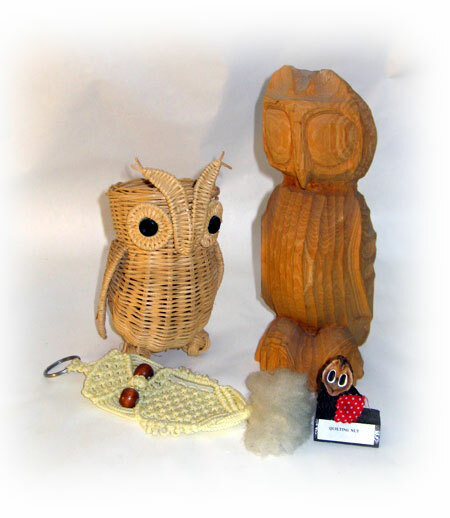 Read more about Mom's Owl Collection, Volume 2! Mom's Owl Collection, Volume 1! Read more about Mom's Owl Collection, Volume 1! Attention Dusty Old Crate Fans! I know you're out there! eBay is full of weirdos collecting all kinds of crap. Mojo knows this because Mojo is one of 'em! When I am not collecting weird crap I am doing other weird things. Like now. I was just now standing outside in the pouring rain just because it was pouring rain. Really pouring rain. It's something I try to do at least once a summer. Not when it's thundering and lightning, though. Mojo might be a weirdo, but she is NOT stupid. But now that I am back inside and towelled off so I'm not dripping on the keyboard, here is one weird thing Mojo is NOT collecting and would much rather have it out of her house. It's an old Pepsi crate my Favorite Mother gave me. She had it in her sewing room, but don't ask me why. If there is one thing Mojo has learned in her life it is "Don't ask a quilter 'why' about anything". 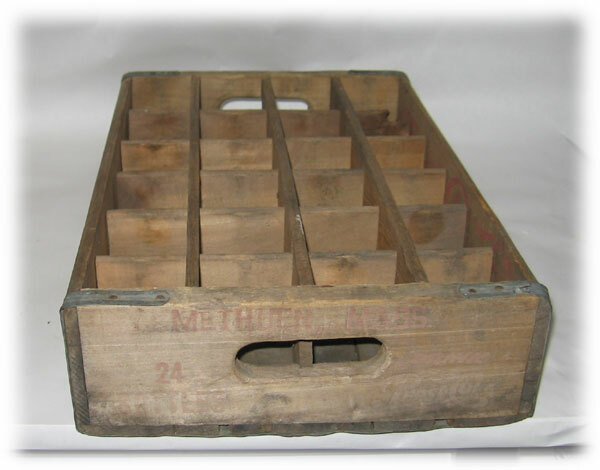 Read more about Antique Wooden Pepsi Crate! Let's take a short break from Mojo's Favorite Mother's crap and instead rifle through some of her own Craptacular archives for the oddment that did not strike the fancy of the discerning eBayer. Here is a classic example. 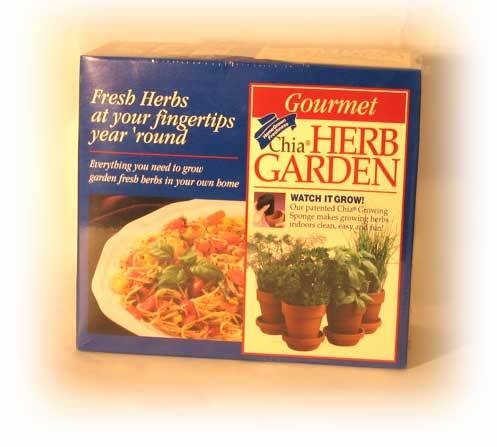 A GOURMET Chia Herb Garden. Not just your average Chia garden, oh no. This is a GOURMET Herb Garden. I know why this didn't sell. It can't be due to the Fine Ch-ch-ch-chia Name, for as everyone knows it wouldn't be Christmas without Ch-ch-ch-chia commercials. I especially like the Chia Scooby-doo. Who on EARTH got the idea that Scooby-doo deserved a giant green afro? Granted, the horrible cgi movie that came out a few years ago for some reason had Scooby dressed up like some Seventies pimp and sporting sunglasses and a large orange 'fro. Why, I don't know--I couldn't bring myself to see the movie. I was never really that HUGE of a Scooby-doo fan, anyway. I mean, I watched it on occasion, but I could take it or leave it. Besides, that movie came well after Chia started selling the Chia Scooby. Read more about GOURMET Chia Herb Garden! If you force me to admit it, I will say I rather like these fellows. Enough that, should they not sell, I will probably keep them instead of hurling them into the garbage and eliciting a minor thrill when I hear them break, which is the unfortunate destiny of some lesser crap. The stuff that shouldn't be burned in a wood stove, that is. If it's burnable, it goes in the kindling pile to await a lighted match, but if it is not burnable and/or is indeed made out of some sort of toxic materials Mojo will just admire the taste and/or savvy of the eBay community and quietly throw it out. But these guys are keepers. Not keepers enough to jealously hoard them and scream "MINE! MINE!" anytime anyone comes within a half a mile of them, but keepers enough that, should they not sell, Mojo would not mind them catching dust on a shelf somewhere. Because these are one of those so-ugly-they're-kinda-cute things that would actually make an acceptable gift in Mojo's admittedly odd world. 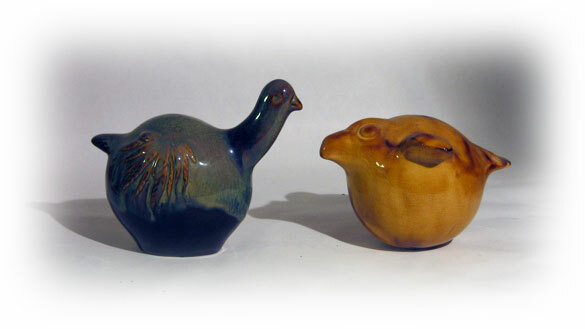 Read more about Ceramic Bird Sculptures! Weird Coconut Bird Holder Thingie! Oh, my. Remember the Coconut Monkey God? If you don't and you wish to be in on the joke, just search for it over on the mojocrap blog. If you do remember and you are now angry with me for bringing up that screeching nightmare, I'm sorry, but someone has to speak of Unpleasant Things sometimes, and if not Mojo, who else? Some insensitive clod? No, trust me, if things need to be unpleasant it is better to have the bland politeness that is Mojo as opposed to, say, someone who swears a lot. Unless it is the sort of unpleasantness that requires swearing, which sometimes happens, even in Mojo's otherwise Perfect World. But my Favorite Mother reads this, and even if I got such unoriginal dreck past the eBay people (and as much as Bad Language people are really trying to SHOCK you, it's like, c'mon, SO dull and predictable...) I would then have to put up with the Maternal Lectures with titles like You Didn't Learn Such Behavior In MY House and I Must Say I Really Didn't Care Much For How You Chose To Express Yourself; Really, You Are A Better Person Than That And I Had Much Higher Expectations. 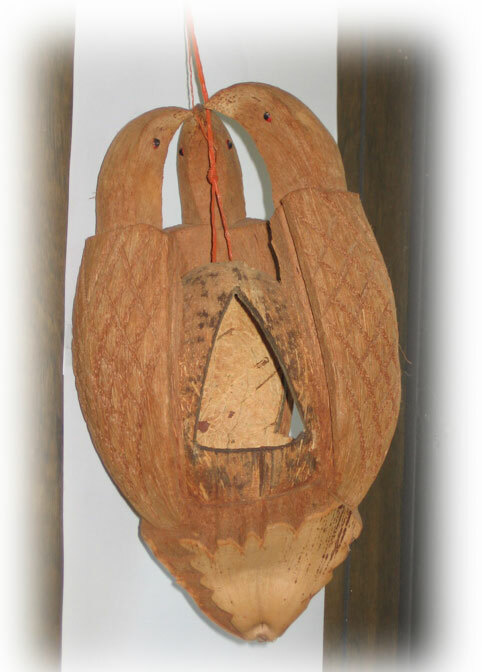 Read more about Weird Coconut Bird Holder Thingie!